Load your cart and check out. Save time and avoid the lines—we'll email you when your order is ready. †Product availability and store hours may vary. *Order must be placed by 5PM for same-day pickup, excluding certain holidays. 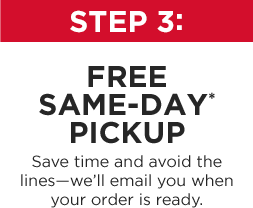 *Same-day pickup is not available when stores are closed. See your local store for more details. Are all products eligible for store pickup? No. Eligibility for store pickup depends on the store's inventory and product assortment. How do I know if a product is eligible for store pickup? Shipping and pickup methods are shown on our product detail pages and in the shopping cart before checkout. 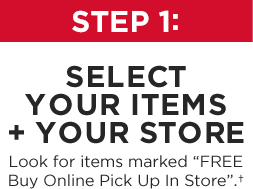 Look for items marked FREE Buy Online Pick Up In Store. Can I pick up some items in my order and ship others to my house? Absolutely! The shipping and pickup method is selected by item, so you are able to check out with a combination of items being shipped and items that you will pick up. Can I split my order between different pick up locations? Yes! Since the shipping and pickup method is selected by item, you are able to select different pick up locations for different items. Can I change my pick up location after placing my order? Unfortunately no. 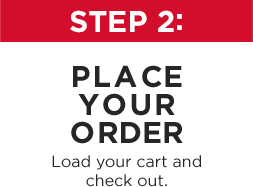 Items must be picked up at the location that was selected when the order was placed. Yes! You will have the opportunity during checkout to designate an additional pickup person. We require their first name, last name and email address so that we can notify you both when the order is ready for pickup. Please note, whoever is picking up the order will need to bring a valid driver's license or government issued ID to the store. When will my order be ready for pickup? Same day pickup is typically available for orders placed before 5:00pm. Orders placed after 5:00pm or after the pickup location is closed will be processed the following day or the next day that location is open. We will notify you via email once the order is ready. Where do I pick up my order once I'm at the store? Online orders can be picked up at the Custom Frame counter. Follow the signs for "Online Order Pickup" or ask a team member for assistance. What do I bring when picking up my order? Please bring a valid driver's license or government issued ID to the store. We will hold your order for 5 days. If you haven't picked up your order after 5 days, your items will be returned to store inventory and you will have to place a new order. After 5 days your items will be returned to store inventory and you will receive a refund. When will I be charged for my in store pickup items? Charges are applied once you receive your ready for pick up notification email. If you haven't picked up your order after 5 days, your items will be returned to store inventory and you will have to place a new order. Items purchased online for in store pickup can be cancelled by calling 1-800-642-4235. Items that are picked up in store can be returned to that store or any other Michaels store location. Please bring your Order Summary with the items that you want to return and view our return policy for Michaels Store Purchases for more detailed information.